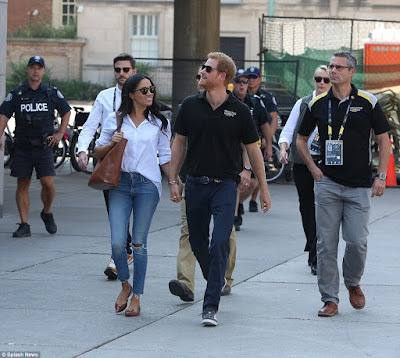 Prince Harry and his girlfriend Meghan Markle have made their first official public appearance together at the Invictus Games in Toronto. 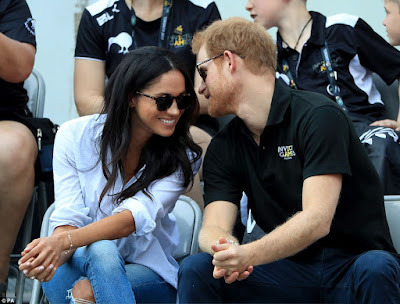 The couple arrived hand-in-hand for the wheelchair tennis semi-final at Nathan Square, Toronto and made no secret of their affection for each other with the royal leaning over to whisper in his girlfriend's ear during proceedings. 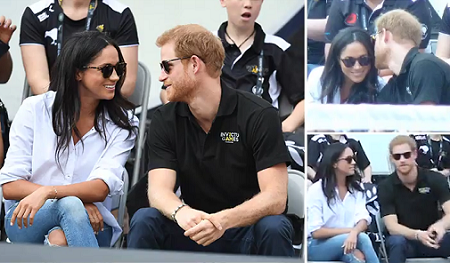 The Suits star, 36, looked completely at ease for her first appearance as Harry's girlfriend, clapping and cheering the competitors along with her royal beau. 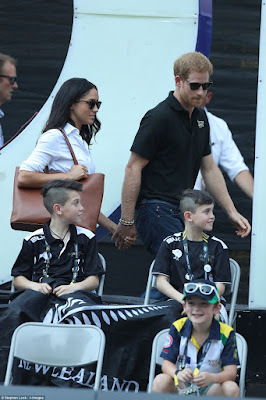 While Meghan attended the Invictus Opening Ceremony on Saturday the couple were careful not to be photographed together, but today's appearance will only fuel rumours that an engagement announcement from the pair is imminent. The couple have been dating for around a year but have waited until now to finally make their first official appearance together as a couple.